Whilst drilling the coal coking stratum named J3 ‘Sukhodolsky’ at a depth of 900 meters (2952.76 feet) from the surface, workers were surprised to find what appears to be the imprint of a wheel above them in the sandstone roof of the tunnel that they had just excavated. Thankfully, photographs of the unusual imprint were taken by the Deputy Chief V.V. Kruzhilin and shared with the mine foreman S. Kasatkin, who brought news of the find to light. Without being able to further explore the site and inspect the imprint at close hand, we are left with only the photographs as evidence of their existence (there was more than one imprint) and the word of a group of Ukrainian miners. Without being able to definitively date the strata in which the fossilized wheel print was found, it has been noted that the Rostov region surrounding Donetsk is situated upon Carboniferous rock aged between 360-300 million years ago, and the widely distributed coking coals have derived from the middle to late Carboniferous; suggesting a possible age of the imprint at around 300 million years old. This would mean that an actual wheel became stuck millions of years ago and dissolved over time due to a process called diagenesis, where sediments are lithified into sedimentary rocks, as is common with fossil remains. ‘This finding is not a PR action. In due time (2008), we as a team of engineers and workers asked the mine director to invite scientists for detailed examination of the object, but the director, following the instructions of the then owner of the mine, prohibited such talks and instead only ordered to accelerate work on passing through this section of lava and on fast ‘charging’ of the section with mining equipment. Owing to that, this artifact and the smaller one found during further work came to be in a tunnel blockage and could not be taken out and studied. It is good that there were people, who in spite of the director’s prohibition, photographed this artifact. I have connections with the people who first discovered these imprints and also with those who photographed them. We have more than a dozen witnesses. As you understand, the admission in the mine is strictly limited (it is dangerous on sudden emissions) and to obtain such permit is rather difficult. With only this written testimony and that of the other witnesses, the photographs remain the only proof of this anomalous imprint, but it must be deemed worthy of mention despite any difficulties verifying the details beyond that which you have read. For, if the photographic evidence is indeed legitimate, then one must question how a man-made wheel became embedded in such ancient strata, when according to scientific orthodoxy man had not even evolved yet. Evidence for the existence of wheeled vehicles in antiquity has surfaced in other parts of the world, as petrified ancient tracks found in France, Spain, Italy, Malta, Kazakhstan, Ukraine, and even North America reveal. A prehistoric site known formally as Misrah Ghar il-Kbir meaning the Great Cave in Maltese (and commonly referred to as Clapham Junction), is located at Siggiewi, near the Dingli Cliffs in Malta. Yet more tracks are to be found in Turkey. Some at Sofca cover an area roughly 45 by 10 miles (72.42 by 16.09 km), and also in Cappadocia, where several pockets of tracks can be seen. The many ruts discovered around the world have caused a great deal of controversy as to their purpose, age, and origin. These mysterious factors remain up for debate, but due to the association and close proximity with megalithic structures, in Malta particularly, and due to the fact that many tracks are now submerged below the sea in that region, many researchers have concluded that the fossilized lines show signs of great antiquity. Bizarrely, considering the anomalous wheel print discovered in Ukraine that we have just discussed, a medieval city-fortress in the Crimean Mountains of Ukraine called Chufut-Kale lies in ruins, but also plays host to a number of cart ruts in stone like those at the nearby site of Eski-Kermen. Dr. Alexander Koltypin is a geologist and director of the Natural Science Research Center at Moscow’s International Independent University of Ecology and Politology. He has spent a great deal of time visiting these sites and comparing them to one another in search of similarities. “I first saw tracks in stone - fossilized car or terrain vehicle traces (usually called cart ruts) on Neogen plantation surface (peneplene in Phrygian) plain in May 2014 (Central Anatolia Turkey). They were situated in the field of development of Middle and Late Miocene tuffs and tuffites and according to age analysis of nearby volcanic rocks, had middle Miocene age of 12-14 million years,” wrote Koltypin. Upon measuring the width and length of the tracks at the Phrygian Valley site, he is convinced that they were created by vehicles of a similar length to modern cars but with tires 9 inches (22.86 cm) wide. With the depth of the impressions of the tracks in stone exceeding that which one would associate with small carts, Koltypin maintains that the vehicles responsible must have been much heavier. He theorizes that whichever civilization drove the heavy vehicles that created the tracks were most likely responsible for the many different but identical roads, ruts and underground complexes which are scattered around the entire Mediterranean, more than 12 million years ago. Aware that the process of petrification can occur within a relatively short period, Koltypin insists that the heavy mineral deposits which coat the tracks and the visible erosion are suggestive of a greater antiquity; along with the surrounding underground cities, irrigation systems, wells, and more, which also show signs of being millions of years old in his view. It is evident that much research is needed to clarify the age and origin of the many tracks that are being discovered at multiple geographical locations, and as easy as it is to simply state that they are the product of old carts which once trundled through these parts, further investigation may well reveal far more complex and remarkable explanations which could well correlate with the mysterious remnants of an unknown ancient civilization as postulated by Alexander Koltypin. 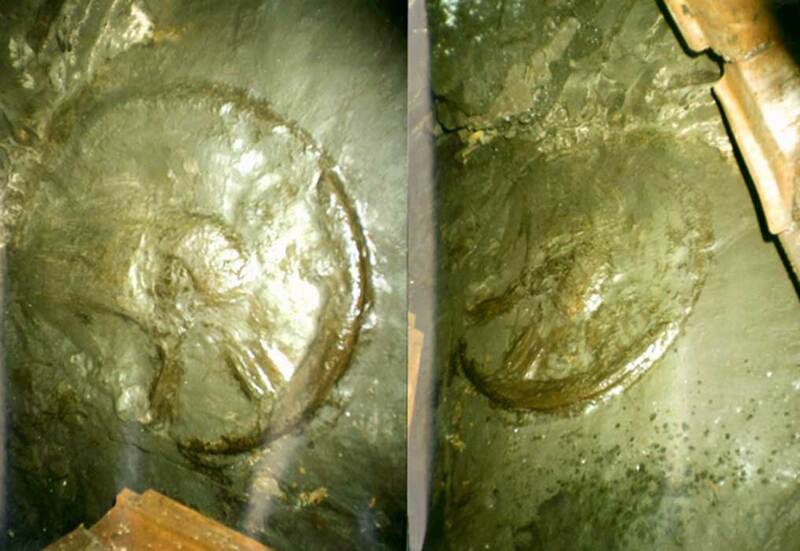 The sheer presence of the fossilized wheel found in the Ukraine is certainly suggestive of the fact that the ancients may have had access to more technology and know-how than is currently accepted. What this &amp; other things in the world that look as tho someone was able to sculpt rock or manoeuvre rock in strange ways, makes me believe we may someday realize the aging mechanism we use is not quite what we think it is, or there were other civilizations in the very ancient past - possibly pre ice age, that have long disappeared, and this current 11,000 yrs or so is merely a new iteration of the same knowledge long before attained, and nothing new. There are so many things that do not fit, refuse to be dated when they should be, and let's face it the current status of science is merely 'what we think we know now' &amp; is entirely possible to be wrong in future years ! What if these apparent ruts in obviously semi-soft mud - now rock - means that there was a time not too long ago when the earth's rocks WERE like that, and only hardened in recent times ? Something is OFF about the whole timing thing !!!! I have long suspected that modern geologic dating is defective and many of the numbers tossed out by earth scientists are pulled out of their...hats in order to conform to Darwinist convention. Perhaps the cart tracks wee carved as a guide for cart wheels, like an ancient type of railway or road? It seems more likely these would have been routing for water. Where are the animal tracks that pulled the carts? Surely 1 or 2 would have remained. If carts were heavy than stands to reason heavy animal would have pulled it whereby leaving prints. Or perhaps you are thinking machine driven??? What I find interesting is the mine owners refusal you let scientists examine this artefact. Are they afraid the government might seize his mine or is something else going on?